As the snow piles up outside, I have turned my thoughts to Spring. Not only because it’s warmer and nature is waking from it’s long slumber, but also because I hope we will be conducting our first blower door test by then. Specifically I’ve been considering what type of results I should be expecting from the blower door tests, and how to interpret them. We made the decision early on to build an air tight house. This guided our choice of building materials, Zip system and tape for the exterior sheathing, gaskets and acoustical sealant to seal all other connections, and foam to seal gaps at the rims, windows and doors. The blower door test will help us seal any gaps we missed. But what target should we aim for? How do we know when the house it tight enough? There are a few standards that define acceptable infiltration levels in a way that can be accurately verified by a blower door test. The PassivHaus standard requires <= 0.6 ACH50. Energy Star 2.0 requires <= 5 ACH50, and Energy Star 2.5 and 3 require <= 4 ACH50. The building code defines prescriptive methods to control infiltration rather than specify testable targets. So why the big range from 0.6 to 5? And what is ACH50? The range is due to the different goals of the organizations behind these standards. 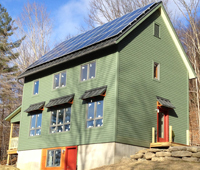 PassivHaus is a non-governmental organization started in Germany. They set the infiltration standard at the lowest level they thought was easily attainable in residential construction as part of a strategy to reduce overall energy use of the home to very low levels and protect the enclosure from moisture that is transported by the infiltrated air. EnergyStar is a governmental organization that works with the construction industry to set standards. They set targets they think can be achieved by builders over a period of time without upsetting a large population of their constituency. The code is the least common denominator. ACH50 is Air Changes per Hour at 50 pascals. Basically air is blown into (or out of) the house up to a specific pressure, 50 pascals (very low pressure, 0.00725 PSI), and then see how hard the fan has to work to keep it at the same pressure. From this they can calculate the cubic feet per minute at 50 pascals, or CFM50, of air that is replacing the air that was sucked out at this standard pressure. To find ACH50 which is in hours, multiply CFM50 * 60 then divide by the House Volume. ‘House volume’ is rarely defined and sounds rather vague and open to creative interpretation. Is it the exterior dimensions and the building height? Or is it the interior dimensions? Do you include the basement? Because house volume is the divisor, the bigger the value the better your resulting ACH. Which leads me to believe that people often fudge their volume by using the outside dimensions instead of the interior volume which can be quite a difference when your walls are 12 inches thick. PassivHaus even subtracts the interior floor and wall volumes (gotta love German precision). As for the basement, if the air barrier separates the house from the basement then don’t count it. In our case, the air barrier continues down the foundation wall and under the slab, so I have including the basement volume. This decision has several consequences. Our ACH value will be lower than if we just use the house volume area, and it will cause inaccuracies later when calculating the cost of infiltration since the basement is not heated directly. I think this is why PassivHaus generally recommends building on slabs, not basements. Let’s look at an example. If our blower door test in the Spring reveals a value of 240 CFM50, then we could end up with the following ACH values depending on how you define ‘house volume’. Listing the different standards we can see the range of allowable CFM50 values. * 13,697 ft3 = Interior volume (including basement), minus interior wall and floor volumes. ** 14,682 ft3 = Interior volume (including basement). Not only is volume vague, why use volume at all? What does the volume of air in your house have to do with the air tightness of your envelope? Another option is to use surface area of the envelope or building shell instead of volume. See EarthCraft House Guidelines to calculate surface area. EarthCraft recommends a target of <= 0.5. * Our shell square footage is 4,189. Slab and ceiling (32 x 22 x 2) + N/S walls (32 x 25.75 x 2) + E/W walls (22 x 25.75 x 2). Considering the vagaries of ACH, the air leakage ratio (CFM50 / ssf) should be open to less creative interpretation. But there is a similar standard that only counts surface area above ground. See the MLR – Minneapolis Leakage Ratio definition. They also state that a value < 0.5 is good and > 1 is bad, same as EarthCraft, yet they count substantially less surface area, pushing up the allowable air infiltration. Comparing the PassivHaus and Energy Star standards with Rosenbaum’s recommendations, I’m inclined to shoot for a target range of 200 to 300 CFM50. So far we have only considered the various standards for air tightness, not the resulting costs of infiltration at various rates nor the additional costs of constructing a tight house. Next week I’ll post some of the numbers I have been working on to quantify the cost of infiltration. Toward the end of the project I will try to quantify our cost of building a tight house. where in NY is your project? We’re near Cambridge. We are still a month or so from our first dower door test, but you can be sure we’ll post the results here as soon as they are available. Hello Harry, I appreciate your approach and your questions. We can quantify both added construction costs and eventual energy costs due to infiltration (along with all other energy related features of a home) using Ekotrope cost optimization of thousands of combinations of energy related features. This helps you evenly district your investments in the most cost effective way. Check out Ekotrope.com for more info or send me an email if you’d like to talk. The Rosenbaum calculation, does shell square footage include all exterior foundation walls and slab? I am using his calculator and have entered all of the inputs, etc. Thanks for any clarification on this. Hi Chris, sorry for the long delay in responding to your question. I included foundation wall and slab because we don’t have an air barrier between the basement and house.